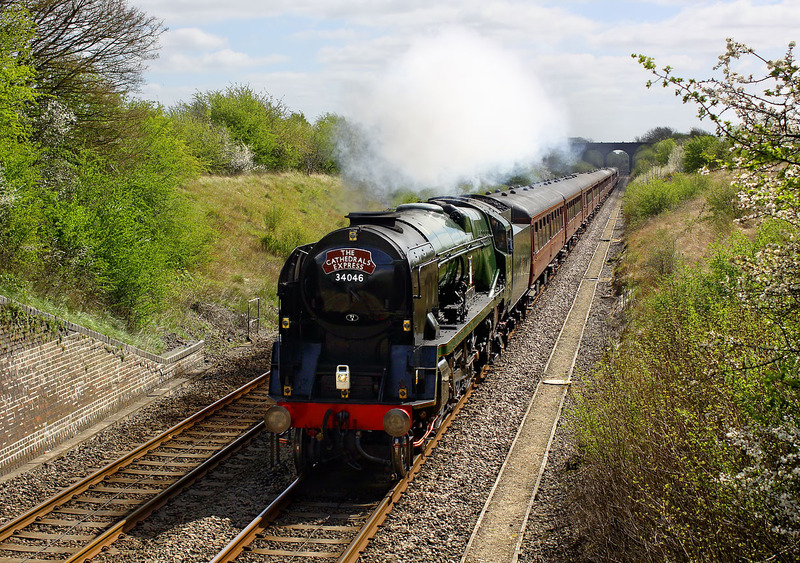 Rebuilt West Country Class 4-6-2 34046 Braunton runs along the Chiltern Mainline at Ardley on Sunday 13 April 2014 with the Steam Dreams 1Z44 10:50 Paddington to Stratford-upon-Avon 'Cathedrals Express' railtour. A very difficult train to photograph (at least south of Leamington Spa) due to the extreme backlighting. However, with the blackthorn out in flower, and the exhaust lifting clear of the train, it makes quite a nice picture. I'm not sure why there are so many people on the high bridge in the background, as the view there is very restricted from this side of the line.